I asked my readers this on another platform. Here are some of the best answers. For me ‘God’ is in everyone rather than being out there somewhere. God is one in the same for all. But only as the yahwah, jehovah god (christian god). The “other” gods have different personalities and the teaching of the yahwah. The Bible states that he is never changing. Names aren’t really important you can call him what you see fitting-Yahwah,jehovah, lord, abba, father, master, or whatever it doesn’t truly matter. What is important is that you follow what he has told you. It is not the name that I follow but the one with the name. Since the teachings of the “other” Gods are not the same and so they can’t be him. So I don’t think they are real. I believe in one G-d and only one G-d — some religions give G-d a different name or different attributes, but (S)He is still the G-d of Abraham, Isaac and Jacob. No. I happen to be a hard polytheist, as well as a henotheist. I believe that all the gods (with the exception of the flying spaghetti monster) exist but I worship my Gods only. For worshiping alien gods is detrimental to Vor Tru (our faith). If you don’t believe that there is a God, then why is life sacred? Why can’t we just go out and murder anyone we want? If there is no God, then it doesn’t matter how you or I live because we aren’t held accountable. And what makes air, water, fire, earth, and space elements sacred? I can see that if you believe in a God that it is something that is valuable and something that God gave to us as a gift when He created it. I could see it being said to be sacred, but if there is no God outside of time and universe, then why would these things be considered sacred? I take it you believe that truth is found in all of us. What Truth is that? How do you know what truth is really True? Either God exists or He doesn’t. Either Evolution happened or Creation happened. Either you believe one is true and not the other or vice versa. For truth to be True there has to be a standard. 1 + 1 equals 2 because it meets the standard that was set within the numbering system. It doesn’t matter if Joe Blow believes 1+ 1 to be 3. He still lives in a world where there is truth and a set of principles to judge whether it is True. Mathew Fox talks about One River; Many Streams. No one has it all, but they all have something. I’m Buddhist. We see all life as sacred. We do not believe in an external “God” but in the sacredness of the cycles of air, water, fire, earth and either (or space) the elements. 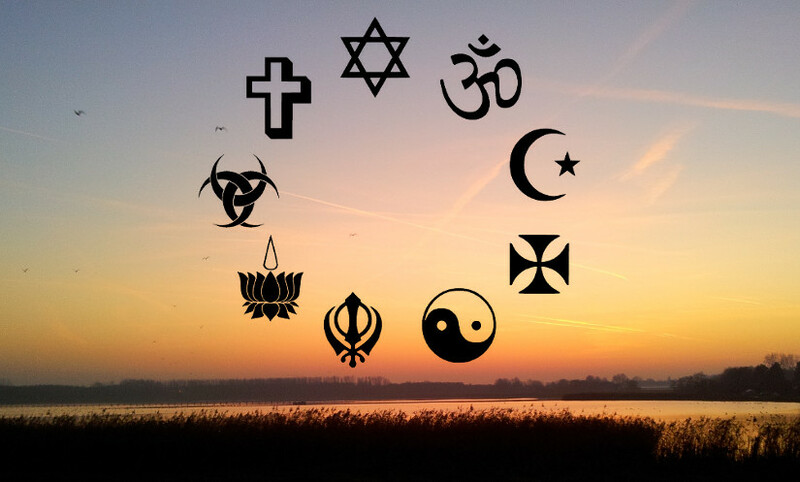 I have come to believe that all religions are a piece of the pie. We all have just a touch of the truth. Together we become Truth. Yes, but we must remove the people created parts of religion to find the same God. Previous Previous post: Do you believe in guardian angels? Next Next post: The Best Religion on Earth is….??? ?